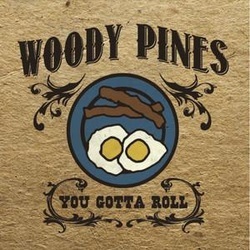 I remember seeing the three piece Woody Pines band several years ago, when they played a storming gig at a small pub in Lewes, Sussex and have been eagerly awaiting their return ever since. I’m pleased to say that they are back again for a full British tour from April 12th this year and are playing in Brighton on Friday 13th! I’m guessing that the purpose of this musically varied but consistently high quality six track e.p. is to make the uninitiated aware of the diversity, within the roots genre, of this now four piece band. It certainly succeeds in showing that diversity despite track one only being distorted radio noise for about ten seconds, although it does help to set the scene and the atmosphere. The band is made up of Woody on guitar, harmonica and lead vocals, Zack Pozebanchuck on upright bass, Lyon Graulty on lead guitar, clarinet and harmony vocals and Mike Gray on drums. Of the five complete songs two are traditional, one is written by Hank Williams, another by Leadbelly and one by Dock Boggs. Those authors alone should give some idea of what to expect and each and every song is treated respectfully but also shows off the individuality of this band, who are equally comfortable whether playing blues, hillbilly, a rootsy New Orleans gumbo or even with a little vaudevillian style. Interestingly Red Rockin’ Chair, the song credited to Dock Boggs, is actually a reworking of his classic Sugar baby recording, on this disc given a haunting resonator guitar treatment, moving the song from the blues into a strong country feel, a shift that works incredibly well. Leadbelly’s Ham and Eggs is given a strong rockabilly treatment and again works really well, showing off this excellent bands ability to imbue any song with their own inimitable style, whilst Hanks Can’t keep You Off My Mind has a late 1940s/1950s honky tonk feel, a little reminiscent of the original. As an introduction to the band and what they are about this e.p really does the job and if you enjoy it, you can then investigate their three previous albums and if they are playing anywhere near you on the British tour, go and see them, you won’t regret it!